The following is partially taken from the 1993 Organ Historical Society Convention handbook. 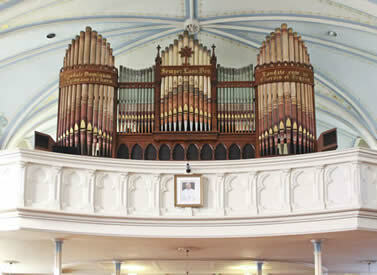 Attributed to Johann Heinrich Koehnken of Cincinnati, the first organ at St. Martin’s arrived in 1861, and appears to have been rebuilt and enlarged, perhaps by Koehnken and Grimm, in 1876. In February of that year, the church’s centennial history relates. Fifteen big heavy trucks and two small ones arrived at St. Martin’s last week. A few days later, two men arrived from Munich. They quickly opened the boxes and promptly and deftly assembled all the parts and installed the organ, the largest and finest in all the West, due to ceaseless efforts of the pastor, Fr. Leander. In 1894, Farrand & Votey installed the present instrument, which incorporates some older pipes, most likely from the previous organ. In 1949, Joseph Ruf supplied a new console, which by 1978 had fallen into disrepair. Sam Bowerman kept the organ going for some years. Several proposals for renovation were shelved until July 1990 when the organ was renovated by the Miller Pipe Organ Co. of Louisville, who provided it with a new console in the style of the original. They also provided a new wind system. The organ was originally pumped through a series of “feeder-bellows” which were operated by a water motor. When the street car line was installed on Shelby Street, 500 volt D.C. current became available and a motor, provided by the Ottis Elevator Co. of Springfield, Massachusetts, and fitted with a “Weston Voltmeter” made in Newark, New Jersey, was installed to drive the water motor, which in turn operated the feeder-bellows system. When A.C. current became available, a unit was installed in the tower of the church which converted the A.C. current to D.C., which ran the D.C. motor, which ran the water motor, which in turn operated the feeder-bellows system. Finally, everything was bypassed except the two reservoirs under the organ and an organ blower was installed in the side of the tower opposite the A.C./D.C. unit. Stops which may have been recycled in whole or in part by Farrand & Votey from the previous organ, include the Swell Dolce Cornet and the Pedal Open Diapason, the Bourdon, and the Dulciana. The Great Double Open Diapason has six wood basses, and the Quint is tapered, as is the Swell Gemshorn; the Swell Bourdon has three metal chimney flute trebles, and the Choir Rohr Flöte has scribed mouths in German fashion and adjustable caps. The Great Mixture is actually III-IV and includes a third sounding rank.. The Swell Oboe appears to be of French manufacture, leading to speculation that it may have come from the Cavaille-Coll firm. The current renovation includes a complete releathing of the organ to be done in phases. The first phase, the Swell division, is completed. The first movement of Charles-Marie Widor's fifth organ symphony played by Paul Weber. Live performance recorded on September 26th, 2014 at the 120th anniversary concert of the 1894 Farrand & Votey organ at St. Martin of Tours Catholic Church in Louisville, Kentucky.